Tips for choosing a running costume. Costume races are nothing new. Folks have been dressing their best for races like Bay to Breakers for years, but the frequency of wearing a costume while racing has certainly skyrocketed in recent years. Being a lover of both racing and costuming I LOVE IT, but with the wrong costume, your race could go wrong. Here are 5 tips to ensure you can win best dressed even if you can't win the race. 1. Don't cover your breathing hole. Sure, masks complete the look, but masks are also incredibly hot, and if they cover your nose and mouth, it will soon become apparent why this is such a bad idea...Masks make breathing very difficult, a very bad idea anytime, but especially while racing. If you show up at the starting line in a huge dinosaur costume you will get all sorts of positive attention, and you will love it until it is time to actually run. Your body heats up while you run. If you are covered head to toe in a full body gorilla suit, the heat has know where to go. If you don't allow a way for your body to cool, you will end up a hot sweaty mess stewing in your own juices. Ewww. 4. Think Tights or short shorts. What do superheroes, Christmas elves, and runners all have in common? They all look fantastic in tights! Tights are fantastic for running, so if you are able to choose an outfit that incorporates tights you may not only win best dressed, but you may get a PR also. 5. Try awesome costumes made for running. Athletic brands like Run Graphics sell tech shirts as well as racing singlets with attitude. I love this brand for everyday training, but it is a must for race day. I love wearing my Run Graphics Pizza singlet to easily answer that question of "what do you think about while running?" 6. Synthetic Material is Best. This is true for running apparel in general, but on race day we want to not only look our best, but also perform our best. Cotton outfits have a tendency to retain sweat and become soggy and heavy. Online retailers such as EDM Clothing Company can outfit you with mind blowing sublimation printed synthetic shirts that make easy, put it on and get out the door costumes that add color to your run while letting your primary focus stay on racing. Do you have to follow all these tips to have a good time? No of course not. Wear something awesome, just make sure you make it to the finish line also. Victor Ballesteros designer of the popular Victory Gear Bag, the ultimate gear bag for ultra runners, is back with a great new addition to his lineup. The Grizzly from Victory Sportdesign is designed with adventure sports and travel in mind. This bag is currently being crowdfunded on Kickstarter. Check out the video. Check out the Kickstarter campaign below to get yours here. In 2014, I set out to run an ultra-marathon, become a dad, and climb Mt. Shasta. I am glad to say, it is only October, all of those things have been checked off my list, so here how it went down, and what I learned about coaching, running, and life. Becoming a dad is by far the hugest adventure I have embarked upon. Coming into 2014, my wife was already quite pregnant, so we were pretty confident this dad thing was going to happen. Sure enough, April 30, my son Bodhi was born. This was with two weeks still remaining of high school track post season championships. What did I learn about coaching? Coaching is a very large time commitment. Coaching at the high school level is rewarding. Challenging young athletes to perform at their best, and rise to the occasion is inspiring because of the consistency with which they often do both, sometimes surprising me, and almost always surprising themselves, but the Coach that wants committed athletes must be even more committed than the athletes themselves, and this takes time. This takes a lot of time. So to the high schooler out there that thinks that their coaches are coaching for the money should recognize that if this is true, given the number of hours their coaches put in, their coach is very very bad at math. What did I learn about life? Being a dad is a huge commitment, and like I would coach my athletes, half commitment will never yield the results you are looking for. If I am going to be a dad, I am going all in. The season finished out great with nearly half the team advancing to the post season, multiple great finishes at the meet of champions, and three very talented seniors, Jessie Colin, Devron Martin, and James Kinney, graduating and moving on to compete at the college level. Though I did complete the season, after the season was over I opted to retire my position as Head Coach of Marin Academy Track and Field to my capable Assistant Coach Taylor Tan as to spend more time with the newest member of my family. In August I competed in the Tamalpa Headlands 50k here in Marin County, California. I should preface by mentioning that this is my first ultra marathon. In fact, I ran the Tamalpa Headlands 50k in 2013, but this year was different. What did I learn about running? Salt is very important. Headlands 50k is a grueling course, I believe with over 6500ft of elevation change over its 31.2 miles of mostly single track trail. This is not your average community 5k. In 2013, I began with much gusto and was on pace to break 4:30 at mile 17. By mile 19, I was limping down the trail, afraid that running might cause my hamstrings or calves to seize due to lack of salt. The next 3 miles to the aid station were miserable. After getting some salt at the aid station I was able to finish the race in roughly 28th place in a time of 5 hours 28 minutes. In 2014 a new story. I carried salt with me taking at least one salt tab about every 7 miles. This time I felt great. I finished 2014 in 11th place in a time of 4 hours 32 minute, nearly an hour faster than the previous year. I first intended to climb Mount Shasta in early spring, and climb via the Avalanche Gulch route, but the week I had set aside to climb, California miraculously ended its drought, just long enough to make my spring ascent impossible with dangerous snow and wind conditions on the mountain. A few month later while on a group run with another group of fantastic ultra runners, I met some runners that were talking about running mount shasta. Thats right, running as fast as they could up a 14,000 ft mountain. Sounds crazy right? It is, so naturally, I wanted in on it. By the time plans were set it was down to just Jack Finn and myself. This video will show what followed. http://www.youtube.com/watch?v=neFaSCOTasQ What did I learn about running? I love it. This climb was to challenge myself and enjoy the outdoors. This was not a race, there was no t-shirt and goodie bag at the end. This was just for the pure pleasure of running. To be outdoors ... Awesome! What did I learn about life? Going all in as a dad does not mean the fun stops. I ran mount shasta when Bodhi was just a few month old. Bodhi and Mom did just fine without me for a couple of days, and more than being tiring and stressfull, it was relaxing to get back into the mountains for a few days. What else did I learn? When mountain running, choose a shoe with a solid single piece outsole. I wore Montrail Fluid Flex, which are great shoes for regular trails, but the soft foam, multi peice outsole was completely shredded after this run. I had to retire them after this run with only 50 miles on them. R.I.P. Now as I have adjusted my schedule to stay at home with my infant son while my wife continues to work, I have seized the opportunity to work from home, and I have embark on another great adventure. I have begun work on a website and mobile app that I have been conceptualizing for quite some time. Kindhat is an online community for sharing real goods and services within local communities. With Kindhat I hope to create a model for an economic system that better aligns our money with our values. Change the economic system we have been living with for decades, that is a monumental task. True, it is a monumental task, but then again so is becoming a dad, and running up Mount Shasta. I am a lover of new adventures, what adventure should I pursue next. Let me know in the comments. Last week Pinnacle Running Head Coach Levi Webb headed out to run up Mount Shasta with Ultra Runner Jack Finn. Here is the report. In preparation for the 2014 Headlands 50k in Marin County, California, I set out on a weekend adventure with Ultra-Runner Jack (John) Finn. Climb Mount Shasta as quickly as possible. To avoid snow covered slopes and dangerous rockfall we settled on the Clear Creek Route. Let’s get an image of a guy, 52 years old, who hadn't run at all since 8th grade cross country, and wanted to run a marathon someday, but had no idea how to approach the idea. At 6’2” and 195 lbs, this guy was not the vision of the sculpted marathoner. He had a history of being over-ambitious and extreme, had been in the restaurant industry, wearing crappy shoes, for decades, had back and knee issues. When he ran, he thought he must look like a overweight Yeti pounding along, leaving startled and disturbed people in his wake. That guy was me, last year. As I began to start running, I had a calf injury, (what a surprise, as I did run like an overweight Yeti) for which I saw Michael Westgate of Westgate therapy. Michael recommended that I contact Levi Webb of Runnaturally.org (now Pinnacle Running,) a professional running coach, to learn the proper form that would enable me to run the Marathon without injuring myself. I had a phone conversation with Levi, after which I scheduled to begin training with him immediately, as I was very impressed with his professionalism and knowledge, as well as his easy and straightforward style of communicating. Levi provided my with a running form and coaching plan that has enabled me to complete the San Francisco Marathon yesterday without injury, but which has more importantly resulted in a change of belief and lifestyle which challenges what I had come to accept as what is possible for me as a 53 year old. There were pieces of the training along the way that were invaluable: the video gait analysis, which illustrated how I had been landing each stride like a framing hammer, on the heel, way out in front of my center of mass, the focus on corrective exercises, the personalized training plan leading up to the Marathon, yesterday… But it was Levis’ un-ending emphasis on a proper running form, the heart and soul of my training, that really became an almost moving meditative practice, where my attention would go when pushed or tired, that got me through the last two miles yesterday, for a 4:31 finish at an average 10:22/mi pace. Whether you are already running, or just getting started running for the first time in your life, I cannot recommend Levi Webb highly enough. http://www.youtube.com/watch?v=2AwRK3js5dg Many of the structural problems I encounter as a Running Coach and Corrective Exercise Specialist begins with fallen arches. This video will get you started on correcting your fallen arches. For those of you that are unfamiliar, the Clymb is an online outdoor equipment retailer that offers daily flash sales. Each daily sale is for only a limited time and often the most popular products sell out quickly, though sometimes shopping on the clymb can feel like black friday at a walmart, the deals are fantastic as are most the shoes they sell. Most everything that shows up on the Clymb is at least 40% off, I have even seen up to 90% off. The Clymb does not always have the largest selection of shoes, but they usually have a decent selection of my favorite brands in minimalist running, including, but not limited to Innov-8, Newton, Altra, Merrell, and usually a handful of others. Ultra runners will appreciate Hoka's here at half their normal price. Though I am usually looking for a new pair of shoes, Clymb has deals on all sorts of outdoor gear for cycling, camping, climbing, even surfing and yoga. Because I love a good deal I know others will also. For every friend referred by you that makes a purchase at theClymb.com, Clymb will reward you with $25 credit. this is a win-win-win for everyone. Theclymb.com gets a new member, your friend saves on their running shoes, and you get $25 credit. If you see the shoes you are looking for, I suggest you buy them immediately. Don't hesitate, if you check back in an hour they may be sold out. This is how they promote their daily sales. Read them or don't, they are not important. I just visit the the sight when I am in the market to buy something. Don't have a friend to refer you, here is my referral link. Sign up through this link and I will be rewarded with $25 Clymb Credit. And thank you in advance. Though it may seem counter intuitive, breathing faster does not provide the body with more oxygen. this is because it takes a moment for your lungs to exchange inhaled oxygen for exhaled co2. The runner that is breathing rapidly is inhaling oxygen, and exhaling the same oxygen before the exchange has occurred. The body needs oxygen for aerobic activity, in fact that is the very definition of aerobic activity. Though your body will eventually make you breath, or stop running, or both, be careful you are not holding your breath at the start of the race due to pre race jitters. Everytime you step to the line take in a few deep rythmic breaths. this will not only ensure you are not holding your breath, but will also help to calm those pre race jitter. Try to take deep slow rhythmic breaths. It may at some point feel like you should increase your rate of respiration, but remember, your primary concern here is not how many breaths you take, but how much oxygen you body is getting. I have been coaching young runners for many years now and one of the most frequent questions I get from parents is "How do I get my kids interested in running?" This question most often comes from parents who themselves are runners and would love nothing more than to see their son or daughter follow in their footsteps, but I have also gotten this question from parents who themselves are not runners, but want to make sure that their kids are leading active healthy lifestyles. Here are some guidelines I have learned over the years that will aid parents in developing their children's interest in running. Children, especially at very young ages, learn to do by watching others. If you are the parent, chances are you are the one they are watching most, this means that your habits, good or bad, are likely to become adopted by your children. If you want your children to run, set the example. The very act of putting on your running shoes everyday and heading out the door is likely to cause your child to want to do the same. Let this be your motivation to be consistent with your running and even if your child does not follow suit, you still have put in quality running time for yourself. Kids in general love to run, but many of them are never provided the opportunity. How many times have you found yourself, or another parent, yelling at their child to "stop running." This is not because they don't approve of the activity, "running," but they don't approve of the setting "grocery store, doctors office, airport, etc.." So instead of disapproving of the activity, why not provide a better setting. Start looking in your area for kid friendly running events and when you find one ask if they want to participate. If your child's school has a cross country team, make sure they know about it, and be willing to drive them to practices, or just take them to the park and cut them loose, but it is important that a parent keep running as an activity and not a chore. The number one thing you can do to make sure your child does not run is to make them run when they don't want to. A child that is pushed into a sport by a parent is very likely to burn out and quit the sport, any sport, running included, as soon as their their parents are no longer around to keep pressure on. An activity that must be done becomes a chore. This does not mean you need to ask each day before scheduled practices whether or not they want to attend, this is a matter of honoring their commitments, but if your child expresses that they don't want to run track this year, do not make them. For a child, running by themselves just feels like work, running with your peers feels like play. Even most adults I know prefer to run as part of group. Check your local area for youth running groups. Here in the Bay Area where I live, I Coach Marin Youth Trail Runs. most well populated areas in the US will have a USATF Youth Track and Cross Country teams. If your child attends an after school group such as the YMCA or Boys and Girls Clubs, suggest a kids running group. When it comes to athletics, the job of the parent is to provide the opportunity and always let your runner know that you are proud of them regardless of their performance. It is the coaches duty to offer constructive criticism, set paces and race strategies, plan workouts etc... This rule applies to all sports, not just running. Do not confuse these two roles, and try not make them the same role. Coaching delivered from parents is received differently than the same coaching delivered from their running coach, the information may be the same, but relationship is, and should be different. Parents that overstep coaches will not only be resented by their children, but also by their children's coach. This is not the end of the world. Some children may not be interested in running. Don't panic, this is not the end of the world. Even if you and your spouse were world class runners, and your child has the best running genes the world has ever known, you may find that your child's interest is in the clarinet. If this is the case provide opportunities for your child to pursue the clarinet, make it social, let the clarinet instructor instruct, and let your child know that you are proud of them. Tight Calves while Natural Running with Danny Abshire. Tight Calves, this is something I commonly see in runners transitioning to a forefoot gait. The real trick is it is not a forefoot strike so much as a parallell landing. In this video Danny Abshire explains proper foot placement while natural running. Danny Abshire is a Running Form Guru, and the maker of Newton Running Shoes. If you have not checked out Newtons Running Form Fridays on YouTube you definitely should. Two of my favorite things in one place. Dr Daniel Lieberman is Harvard Professor of evolutionary biology at Harvard. Dr. Lieberman's studies on barefoot running is largely responsible for bringing barefoot running form into the modern running conversation. This interview with Stephen Colbert of the Colbert Report originally aired 5/16/2013. There is a ton that I love about the Inov-8 Bare-X 150, with only one little downside. The positives- Lightweight, roomy toe box, zero-drop, no tie lacing, look awesome, very durable, incredible comfortable. The downside...very little traction. All in all one of my favorite shoes yet. The Inov-8 Bare-X weighs in at only 150g (hence the 150 in the name). I believe this makes the Inove-8 Bare-X 150 the lightest shoe produced by the Innovate company, and much lighter most other conventional, and minimalist running shoes. The Bare series from Inov-8 all feature a zero-drop differential. this means that the heel is not raised higher than the forefoot, better accommodating a forefoot/midfoot landing while running. If you are new to zero-drop shoes, these shoes will likely require an adjustment period, but you are not getting any younger so their is no time like the present to adjust to a zero-drop shoe. The single piece upper is perhaps my favorite feature of the Inov-8 Bare-X. The Inov-8 Bare-X are made to slide on like slippers, and are snug enough to not let your foot move around in the shoe with or without a gentle pull on the incredibly simple lacing system. so shoes simply slip on and off with ease, and there is no tying required. These are my go to shoes not just for running, but when I need to slip on a pair of shoes to take out the trash, or run to the store, or check the mail....Slip on...Slip off again. They are comfortable enough I have also been known to where them as my house slippers. I was skeptical when I was first considering the Inov-8 Bare-X because of the lack of rubber on the outsole. I thought "an EVA outsole will never hold up to the trails I run." I was wrong. Thus far I have put in 400 miles with these shoes, 95% of which are on the trails of Marin County where I have made my home. The outsole is lacking in traction which is no problem at all if used as intended....on paved surfaces, on trail these shoes will work, but an steep or muddy terrain you will want to tred lightly. Innov-8 did well by making all their Bare series shoes with a nice wide, foot accommodating toe box. Other great shoes by Inov-8 such as the popular F-Lite series are not overly narrow, but I do appreciate the extra room afforded by the Bare-X. I bought my Inov-8s at TheClymb.com. this sight offers great deals on all sorts of outdoor gear including innovates. By ordering from TheClymb.com was able to purchase the Innovate Bare-X for $55. that is more that 50% off of the retail price of $120. Not to mention, if you sign up through this link, I will get $15 credit toward my next purchase. http://www.youtube.com/watch?v=wRkeBVMQSgg This is one of the best videos I have seen describing proper running technique. The first thing to notice about the new Newton Gravity is that it is now available in colors that you will want to wear. Though color is not the most important aspect of a shoe, it is certainly the first thing to get noticed. That being said, I love the green-on-black look of the newest line. The fit of the Newton Gravity is right on. Unlike the Newton MV2 the toe box is roomy and accommodating without letting the foot move around. These shoes fit wonderfully right out of the box and continued to remain comfortable until they were retired at 350 miles. The upper is a stylish and durable. with extra reinforcement in all the critical places. In particular I appreciate the additional stitching reinforcing the toe baox. I know I am not the only runner to have shoes have a blow out around the toes, and did I mention, now Newtons are available in colors you will want to wear. Weighing in at just over 9 ounces, the Newton Gravity is one of the heavier shoes I have reviewed. Compared to the average running shoe it is on the lighter side, but compared to the Newton MV2 (about 6 ounces), the Newton Gravity is a beast, but this weight difference did not seem to slow me down, and the Newton Gravity Trainer lasted twice as many running miles as the Newton MV2 before critical fail. The outsole features the classic Newton four lugs under the forefoot. These lugs raise the forefoot and provide comfort and protection under the forefoot where the foot of the natural runner will first contact the ground. Directly beneath each lug is a corresponding cutout in the midsole, this is what Newton has patented as their "Action-Reaction Technology," designed to return a small amount of energy with each stride. I am still unsure of my feelings on this Newton gimmick. I feel the best shoes are free of gimmicks, but the Newton gimmick is a gimmick in the right direction, encouraging a forefoot stride, rather than most previous gimmicks which were designed to make heel striking more comfortable. The Newton Gravity has a 3mm differential. This is less than most running shoes, however, as the champions of "natural running," I do wish that Newton would take a step forward and join Altra in dedicating to only making zero-drop shoes. Currently the only zero drop shoe sold by Newton is the MV2. From the moment I first wore the Gravity it became my go to shoe, and it remained my go to shoe for about 350 miles. I should qualify those miles. Nearly all of those 350 miles are trail miles, and the Newton Gravity shoes did not fail until I wore them for the Dipsea-Boy, an unofficial Trail-off trail adventure race. At some point during this race the glue holding the lugs part of the outsole to the midsole failed. Unlike my experience with the Newton MV2, the upper remained in quality condition and would probably hold for hundreds of more miles. Call for responses: I want to know what you think. Have you worn these shoes? Was your experience similar? Post questions and comments below. - If the foot lands in front of the center of mass the runner is likely to heel strike. - If the foot lands directly beneath the center of mass the runner is likely to land mid foot or forefoot. Where is my center of mass? The best way to explore your center of mass is to stand erect. When standing erect all mass should be centered directly over the feet. While in this position of having the feet directly beneath the center of mass try marching in place. You will notice while you do this that as long as the feet are beneath the center of mass you will always land forefoot/midfoot. Try running in place and this will remain true. The example above is only minimally useful because most of us do not want to stay in the same place while running. This is where shifting your center of mass comes in. If you were to again stand erect and this time lean slightly forward at the ankles you are likely to fall forward. This small change in your center of mass caused gravity to pull the body forward. This gravitational pull is the energy that a runner should be taking advantage of while running. To prevent gravity from pulling you all the way to the ground you now place the foot beneath the center of mass. Do this repeatedly and you are now running. As long as the center of mass is shifted slightly forward gravity will continue to pull the body forward. placing a foot beneath the center of mass as the body moves forward will keep the force moving forward rather than letting the body fall to the ground. To often I encounter runners that try to transition to a forefoot strike by pointing their toes, but still placing the foot in front of the center of mass. This is likely to eventually lead to problems and or discouragement. The real focus should be shortening the stride to ensure the foot lands beneath the hips (this is approximately where center of mass will be while running), doing this will automatically ensure a forefoot strike without the braking forces caused by landing the foot forward of the center of mass. 1. Run as if being pulled forward by a string coming from the center of your chest. This imagery of being pulled forward from the chest will help put your body in a position where the center of mass is slightly forward. This will allow gravity to propel you forward. 2. Increase cadence to 180 steps per minute. Increasing the cadence will shorten the stride as well as provide added energy from muscular rebound. 3. Ensure you have bounce. If the foot is landing beneath the center of mass you should be landing on the balls of your feet (or mid foot), when this happens you should have a slight sensation like jumping rope. To practice this, try jumping rope before you run. You will notice that there is a certain rate at which you can bounce making jumping rope easy, try going half that rate and you will notice jumping rope becoming much more difficult. If you can recognize this bounce while running you are likely landing your feet beneath your center of mass. Was this helpful? Was this confusing? Let me know using the comment space below. By Coach Mike Lotter After 2 runs in my Fila Skele-Toes Bay Runners, mostly hilly, dirt/rock trails and fire roads, a little pavement, I am impressed and would buy them again. According to the label, this 'Bay Runner' model is made for any terrain, and so far, I find that to be true. The Fila Skele-Toes Bay Runner Model feel fast, and according to my GPS, are fast. The Fila Skele-Toes have minimal tread but great traction because of the toes getting involved. They're great for picking one's way through rocky sections of trails that are common and sometimes troublesome on Mt. Tam. The Skele-Toes Bay Runner make this aspect of trail running fun for me, like a dance. Rock protection is excellent, as the Skele-Toes Bay Runner, though light and thin, have a tough sole. They also have, as the other Skele-Toes shoes have, a 4 toe design that encapsulates the 2 smallest toes together in one toe box. This ensures more protection from snagging or stubbing on objects along trails, of the pinkey toe (a problem for users of FiveFinger designs, at times). The shoes look great but not too flashy, in a grey with yellow draw string cord for laces, but there are lots of colors to choose from. The Fila Skele-Toes Bay Runner are a true zero drop shoe. This means like all good "barefoot shoes" there is no heel rise. Fila does produce a road version of Skele-Toes with a sole more similar to that of the Nike Free 5.0. They are light and fast and good on the track and on roads, however, unlike the Bay Runner model I do not recommend these other Skele-toe shoes for trails or dirt with any gravel because they pick up pebbles and store them annoyingly in the spaces between the panels of soft the sole. The 'Bay Runner' has no such problem and I have not found a terrain these shoes do not like. I do not recommend either version of the the Fila Skelet-Toes for really long runs, although I'm sure some runners would have no difficulty doing trail ultras in the Bay Runner or a marathon in the road version. I highly recommend the specialized socks such as Injinji socks be worn with the Skele-Toes, for any distance and especially longer runs. These shoes require socks for 2 reasons: they chafe toes a little, that can cause bloody blisters after only 5 miles without toe socks (my experience). Also, the shoes, like any shoes, will get stinky quickly without socks. Last but not least is affordability of these shoes. I have seen the Fila Skele-Toes, both the Bay Runner and the road version for great prices at some discount stores. I got mine for only $36. Compared to the Vibram FiveFingers, or Merrell Trail Glove this is a steal. Mike Lotter is an avid runner and and High School Track and Field Coach in Marin County California. [youtube http://www.youtube.com/watch?v=2KzMfSEvA2Q] LaSportiva has long been known for their fantastic line of rock climbing shoes, and less known for their trail running shoes, but with the LaSportiva Vertical K that may be about to change. LaSportiva has dubbed the Vertical K as not a trail running shoe, but a "mountain running shoe," and rightly so. The radical design of the Vertical K provides traction and rock protection that goes well beyond what a casual trail runner would require. This is not the shoe for a stroll through the woods, but for planting a flag at the top of a mountain and bombing back down the scree fields. For being such a durable shoe, the LaSportiva Vertical K is surprisingly lightweight. At only about 7 ounces the weight of the Vertical K rivals that of the New Balance Minimus Trail as well as the Merrell Trail Glove. To add to the list of surprising features of the vertical K is it's flexibility. From toe to heel, the vertical K folds over itself with ease. To a runner this means that your foot controls where the shoe bends rather than the shoe controlling how the foot bends. The LaSportiva Vertical K has a 4mm heel-toe differential. Not a large drop, but still not a zero drop shoe. At 4mm, the heel-toe drop of the Vertical K falls into similar company as the Nike Free 3.0, Brooks Pure series and the Saucony Kinvara. minates the need for a rock plate, as the crevasses are deep enough and the foam soft enough to absorb the impact of sharp objects that a rock plate would usually protect against. The one piece upper fits snuggly and holds the foot firmly in place with no rubbing or irritation on any particular part of the foot. The toe box is not incredibly roomy, but it is roomy enough that the edges don't blow out and the toes can wiggle. The entire upper is enveloped in a stylish Nylon wrap. The Nylon wrap seems to do little but to keep the laces tied and free of debris, but is stylish none the less. This shoe is all about the traction. The traction of the vertical K is unmatched by nearly any shoe it the same weight class. The only other trail shoe I can think of that provides an equal amount of traction in a lightweight trail shoe is the Innovate X-Talon. The Frixionoutsole (LaSportiva's name for really sticky rubber) enhanced with durable lugs reinforces the vertical K as a true mountain running shoe. Have you tried the Vertical K? What was your experience? Leave your comments below. Though this book lacks the inspiring stories and colorful prose of born to run, it is definitely a suggested read for serious runners. 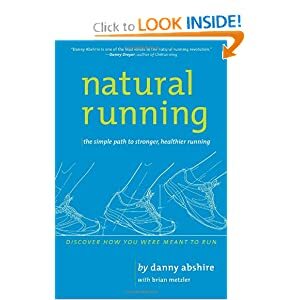 Natural Running is not the most fun read, it read like a text book. Natural Running is after all written by a professional running expert rather than a professional author, but the content alone is enough to keep the reader interested and turning pages. The author, and founder of Newton Running Shoes, Danny Abshire, makes a strong argument for the importance of running with a gait that allows the foot to land beneath the runners center of mass. The reader will gain a better understanding of the mechanics of the foot, and how various foot strike patters affect the overall biomechanics of the body. When first opening the pages of Natural Running, I was expecting a long infomercial on the qualities of Newton running shoes, and there was a touch of Newton promotion, but the book was much more informative than it was an advertisement. Interestingly enough, after reading Natural Running, in my mind, the ideal running shoe, far from being Newtons, which are full of gimmicks, would be Vibram Five Fingers, or better yet, no shoe at all. Whether you believe that natural running is a fad, a trend, or a saving grace for runners, your knowledge of running is not complete until you have read this book.